With Kobe Bryant nearing the end of his career, you want him to finish strong. The 37-year-old future Hall of Famer, who has been limited to just 41 games over the last two seasons, is reportedly medically cleared for all basketball activities, just as his possibly final NBA season rears its head. Kobe returns to a makeshift roster with a lot of potential, but no one of the caliber of Pau Gasol, Dwight Howard or Steve Nash. Still, with a fierce competitor like Kobe, some veterans and two young studs in tow, the Lakers should be able to churn out more than 21 wins. 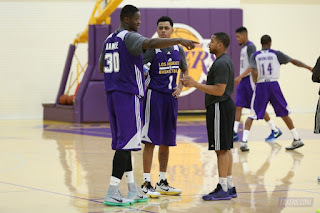 Power forward Julius Randle (the #7 pick in 2014) returns after missing all but one game in his rookie season. As you probably know, he broke his right leg in the season opener and sat out the entire year. Randle averaged 11.5 PPG and 4.0 RPG in the Las Vegas Summer League, flashing his strength and agility. Shooting guard Nick Young (13.4 PPG on .369 3P%), reserve center Robert Sacre (4.6 PPG, 3.5 RPG), waiver-wire claim Tarik Black (7.2 PPG, 6.3 RPG), sophomore combo guard Jordan Clarkson (11.9 PPG, 3.5 APG) and 6-foot-11 power forward Ryan Kelly, who also remain on the roster from last year. Gone are the hapless Carlos Boozer, big men Ed Davis and Jordan Hill, and guards Wesley Johnson, Wayne Ellington, Jeremy Lin and Ronnie Price. They are replaced by 2015 draft picks D'Angelo Russell (#2), Larry Nance, Jr. (#27) and Anthony Brown (#34), veterans Brandon Bass (2 years, $6 million), Lou Williams (3 years, $21 million), Metta World Peace (1 year, $1.5 million) and trade acquisition Roy Hibbert (in exchange for a future second-rounder). The roster is rounded out by shooter Michael Frazier, Brazilian point guard Marcelo Huertas and shooter Jabari Brown. The Lakers could have decided to strip down their roster in preparation for the post-Kobe Bryant era, but instead they chose to tread water, signing some serviceable veterans to surround their $25 million man with. The future is firmly in place with Julius Randle and D'Angelo Russell, and you can only hope that he the young guys soak up as much as they can from their HOF team mate.